Among the splendid Christmas loot I received this year was a copy of cocktail impresario Dale DeGroff’s “The Essential Cocktail.” The gift came from Mrs. F. and she’s been helping select and score its offerings. 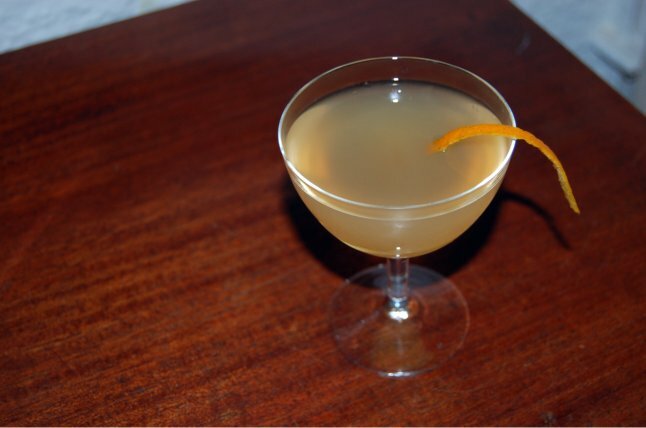 DeGroff, who revived the cocktail menu during a stint as head bartender at the Rainbow Room in the 1980s, is arguably the father of the contemporary cocktail revival. In his volume, published in 2008, he includes lists of classics, adapted classics and some of his own adventurous creations. We’ve only dabbled in the first two categories so far. Among our favorite recipes is the Ritz, a cognac and champagne concoction DeGroff created in the 1980s. It graces the book’s cover and, while designed as a variation of the Champagne pick-me-up, it is definitely an evening cocktail. For more of DeGroff’s work, go to his King Cocktail. Stir together the cognac, Luxardo, lemon juice and Cointreau over ice in a mixing glass. Serve in a cocktail glass, topping off with champagne and garnishing with the orange peel.